The area of Shyrokyne remains a hot spot. 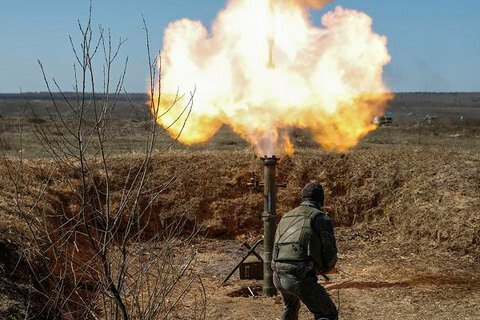 The militants of the so-called "DNR" on September 8 used artillery in the area of Shyrokyne in Mariupol sector and continued to use 120-mm and 82-mm mortars in the areas of the villages of Shyrokyne, Talakivka and Vodyane, ATO headquarters reported in a 9 September morning briefing. In Donetsk sector, provocative attacks continued near Avdiyivka, Verkhnyotoretske and Novhorodske. They fired machine guns, small arms and grenades. In Luhansk sector, the Russia-backed militants fired small arms, machine guns and rocket-propelled grenades at Novooleksandrivka and Novozvanivka. An enemy sniper was active in the area of Popasna and Novooleksandrivka. Over the past day, the militants launched 24 attacks on ATO positions, including 11 attacks in Mariupol sector, 7 in Donetsk sector, and 6 in Luhansk. On September 1, a new ceasefire was announced in Donbas, the first since early May. It was mostly quiet in Donetsk and Luhansk regions. According to OSCE, the number of attacks dropped by 90% over that period of time.